Diego Chara was simply huge in this match. And he gets to play in leg 2. 4 teams, 3 matches, 2 weeks, 1 MLS Cup. 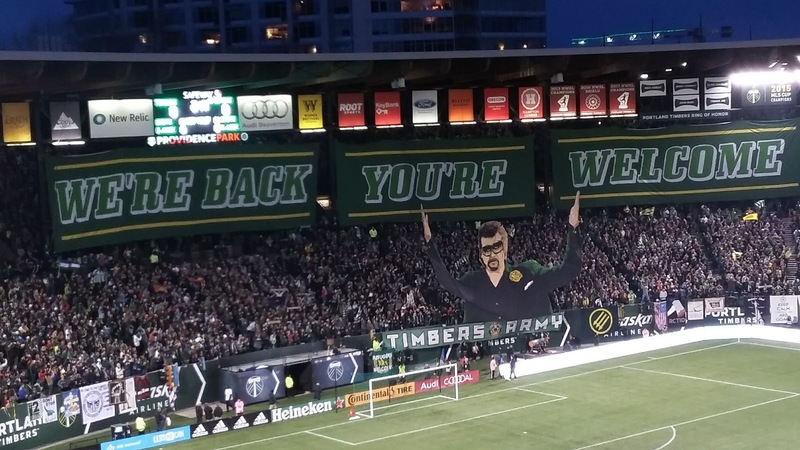 If you had told me that the Portland Timbers would be one of the teams left standing in late November under a new coach back in January 2018 when Gio Savarese was hired, I might not have fully believed you. Granted, it was easy to be optimistic after his initial comments, but a lot has to occur for it to become reality. Whether it's strategy, talent, performance or pure luck that got them here, the Timbers found themselves in their 3rd Western Conference final in their 7 MLS seasons with just 120 minutes of soccer against Sporting Kansas City standing in their way of their second MLS Cup appearance. The teams played to a scoreless draw in Portland during the regular season back in June, while Portland struggled in Kansas City back in August during a frustrating 2 match road trip that saw the Timbers get blown out in D.C. United and Sporting, but neither match had either side feature their strongest teams. Portland has been much improved after that particular road trip, and they were hoping that a rejuvenated and organized offense that found gold versus FC Dallas and Seattle would be enough to break down a staunch Sporting backline. 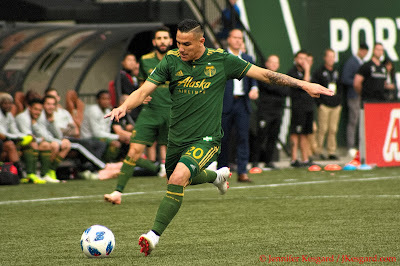 However, a plethora of created chances and shot attempts didn't produce a goal that stood for the Timbers, yet the Portland backline held strong and resourceful as the teams played to a scoreless draw in leg 1 of their 2 match conference finals. The teams have played each other 15 times since Portland joined MLS back in 2011, and the scoreless draw marks the 4th draw between the sides without having a scored goal, with 3 of those occurring at Providence Park. While Portland didn't get a goal for their troubles despite having advantages in possession time, shot attempts, shots on target and chances created, the Timbers earned a key tiebreaker in not conceding a goal to Sporting in their leg at home. With road goals being the first tiebreaker after regular time within the 2 playoff legs, Portland can advance to MLS Cup by beating Sporting KC on their home pitch or earning a draw with at least 1 goal scored for each side. Sporting will need to tally at least one goal and hold Portland scoreless to earn the trip to MLS Cup, and considering that Sporting won 10 and drew 5 in 17 regular season matches with a plus 17 goal differential, they are a tough out at home. During the postseason, however, Real Salt Lake showed good resourcefulness to tally 2 goals at Children's Mercy Park and push the heavily favored SKC into to scramble until the final moments of their home leg. SKC Coach Peter Vermes would be without one of his key weapons as Diego Rubio earned an accumulation suspension for a second half caution versus RSL, meaning Vermes would have to replace one of his leading scorers for this match. Savarese had some difficult lineup decisions to make despite having nearly 2 and 1/2 weeks since their last competitive match in Seattle. Andy Polo, Andres Flores and Jorge Villafana were playing international matches during the break time, with Villafana appearing for the U.S. Men's National Team back on November 20 against Italy in Belgium for a 15 minute stint. David Guzman was injured in the Seattle series and Samuel Armenteros has been dealing with various ailments for several weeks, so part of the planning would be to see who would even be available. Polo picked up a calf strain in training while Armenteros was still dealing with back spasms, thus making them unavailable for the match, but Flores, Guzman and Villafana were all back and listed in the game day 18. Jeff Attinella again started in goal with the usual backline of Zarek Valentin and Villafana as the left and right fullbacks and Larrys Mabiala and Liam Ridgewell as the center backs. Guzman paired up with Diego Chara as the defensive midfielders in the 4 - 2 - 3 - 1 formation that has worked well for Portland over the past weeks, with Sebastian Blanco, Diego Valeri and Dairon Asprilla as the trio of attacking midfielders. With Armenteros out, Jeremy Ebobisse again started as the lone striker with Lucas Melano available off the bench. Flores and Melano highlighted the various sub options for Savarese, alongside goalkeeper Steve Clark, defender Alvas Powell, centerback/midfielder Bill Tuiloma, defensive midfielder Lawrence Olum, and midfielder Tomas Conechny. Vermes kept his approach fairly straight forward with Sporting, just replacing Rubio with Khiry Shelton in the trio of strikers in the 4 defender - 3 midfielder - 3 striker formation. Tim Melia, once an MLS pool goalkeeper that is now regarded as one of the best keepers in the league, again started in goal with his veteran defensive line of Seth Sinovic, Ike Opara, Matt Besler and Graham Zusi. With Ilie Sanchez patrolling the middle as Roger Espinoza and Felipe Gutierrez flanking as the midfield wings, it would be up to Shelton, Daniel Salloi and Johnny Russell to generate chances for Sporting. Vermes chose his bench rather conservatively with just little used Gerso Fernandes and Gianluca Busio as the only attacking options and Yohan Croizet, Krisztian Nemeth as the midfielders. Sporting tends to play a conservative approach away from their home park, so it appeared that Vermes would allow his side to absorb more pressure and counter only when presented with a chance. The primary goal in the lineup, however, appeared to get out of Portland without conceding a goal at Providence Park and take their chances in leg 2. Considering the aforementioned home success at their stadium, this could seem like a wise approach, but the playoff version of the Timbers has proven to be very resourceful on the road with wins at FC Dallas and the crazy shootout win in Seattle that advanced them to this point. David Guzman was available and nearly had a goal on the afternoon. Perhaps it was an omen of the night between the participants from the famous 2015 Double Post match in the knockout round of the playoffs would again have the post figure into the game time result. After Blanco pulled a shot wide of the North End goal in the 4th minute that was rushed, the right post took away a goal in the 6th minute when Valentin stole a ball on the right flank and put a cross to the spot. The ball glanced off Sinovic and caromed just outside the box on a bounce to Villafana, who had pressed forward. Jorge unleashed a low lining shot with his left foot that sped towards the right post, struck the inside of it and then caromed off to the left into space to be cleared. Portland did generate several other shots and chances, with the best of them a stoppage time header by Ridgewell that Melia saved within traffic, but the Timbers were really unable to threaten the SKC defense that much. 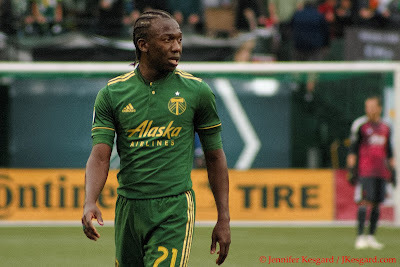 Sporting, meanwhile, had just one shot by Bester in the 9th minute which was off target, as the Timbers defense remained diligent, resourceful and in sync. The challenge became stronger in the 18th minute when Mabiala was injured trying to clear a bouncing ball away from Salloi. After making the clearance and Shelton made some contact with Mabiala, Larrys crumpled to the turf and had to be stretchered off moments later. In stepped Tuiloma, who made several key blocks to passes and shots during this first half performance. SKC was able to get more space in the second half, and had several close calls to get a welcome road goal. Russell chipped a shot way out of play in the 47th minute off a drop pas from Gutierrez, but that wouldn't be his only close call. Russell pulled a long shot from the right flank way left in the 79th minute off a good run from Salloi, but Russell had a door step chance in the 86th minute off a deflected cross from Salloi that Shelton first received and shot, but it was deflected back into Russell's path and he pushed it wide left as the offside flag went up to stop the run. Salloi had a late opportunity to attack the goal off a drop pass, but his shot was blocked by Ridgewell out of harm's way. After a first half that saw them execute just one shot, SKC rebounded with 8 shots with a missile from Sinovic being the only shot considered on target. SKC's movement was giving them chances to attack, but the resourceful Timbers defense countered their attack with good marking and effective communication. There were some very tense moments where it looked like SKC might get a goal, but Attinella and his defense were able to celebrate their second shutout of the playoffs in front of an enthusiastic home crowd. Portland's offense would continue to create chances on goal, but the notable chances came in the 82nd minute courtesy of a Tuiloma header off a Valeri free kick that forced Melia to make a late reaction save, and a Blanco shot at the 90th minute that Melia caught easily without trouble. The Timbers thought they had taken the lead in the 70th minute when Sinovic took down Asprilla with a hard tackle that Center Official Robert Sibiga warned the SKC player about, but there was no extra discipline. Valeri put the free kick from the right flank to the left post where Ridgewell headed it off the left post and Melia bumped it right to a waiting Guzman, who headed it past the sprawling keeper to put his team on top. However, VAR reviewed the sequence and the replay showed that both Ridgy and Guzman were offside on the restart by a good margin, and Sibiga ended up waving off the goal. 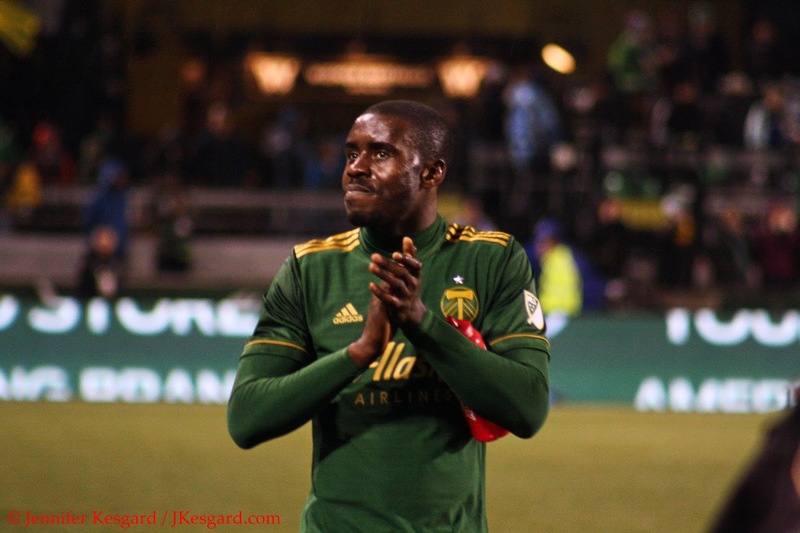 The Timbers' offense would end up with more possession, more shots on target, more crosses and good passing percentage, but Portland could not solve Melia and the SKC defense. Valeri himself ended up creating 6 of the team's 11 chances on goal for the night, but the teams ended up exactly as they started in terms of goals. The stakes of the leg 2 match on Thursday, November 29 are fairly straight forward - Portland can advance with an outright victory or a draw involving at least 1 goal for each side. Another scoreless draw invokes the dreaded extra time with penalties if neither team scores in the extra 30 minutes, while Sporting needs to get at least 1 goal and not concede anything to advance. This situation does give Portland a slight advantage with road goals being weighted as the first tiebreaker in regular time, but considering the stout SKC defense, Portland will need to come up with some different tweaks to advance to their second ever MLS Cup match. They will also need to keep organized and focused on defense, especially if Mabiala can't go on Thursday; reports indicate his injury was a serious ankle sprain instead of something more severe. Portland also avoided any disciplinary suspensions in leg 2 with Guzman receiving the only caution of the match, so all players should be available health permitting. Sporting will have Rubio back available, and considering he is their third leading scorer in the regular season, this is an important weapon to have in your lineup. However, Sporting's defense has shown cracks at points at home late in the season, and the Timbers have been a very good road playoff side this year. Same as it ever was. The Timbers Army does it again. 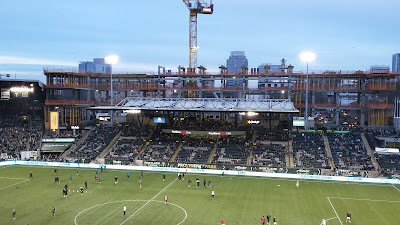 It was very bittersweet for me personally to wrap up my 10th home season officially covering the team, knowing that this match would be the last soccer played at Providence Park for the 2018 MLS season. 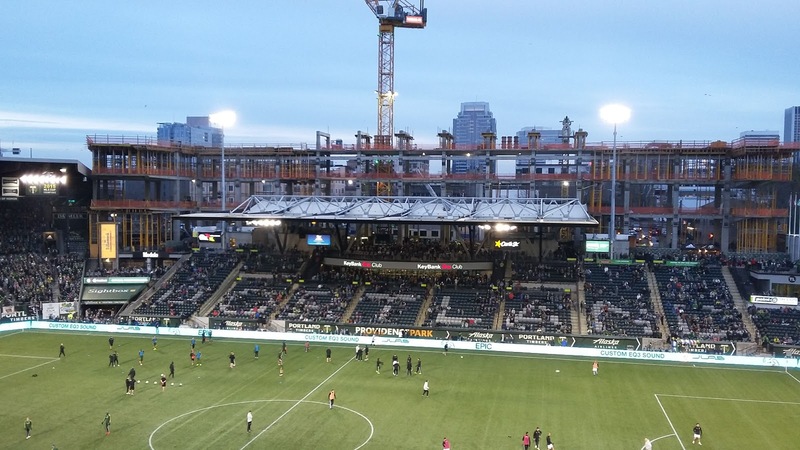 With the new Tanner Creek deck taking shape on the east side of the stadium, construction plans would go into overdrive after the match to get the expansion ready for the early part of the 2019 MLS season. The team has already indicated that the home opener for next year will again be delayed with no pre-season tournament, so it's likely April or early May before we get to see the team in familiar surroundings. However, I know there is still plenty to be decided in this year, and I'll be watching the events unfold on television just like everybody else. Portland might not be getting the big press or the love from the analysts in terms of their chances to advance, but I like this club's chances against anybody in a one match situation. They've certainly shown enough resiliency and moxy in this year's playoffs to reinforce the great #believebeyondreason slogan that littered social media back during the famous 2015 MLS Cup run.